Physical education doesn’t look much like it did when most parents went to school. Gone are the days of being beaned with a ball in dodgeball and the competitive team sports that often involved students feeling left out. Today, the physical education curriculum in our schools focuses on fitness, fun, and inclusion in ways that inspire students to be physically active and to teach skills that we hope will lead students to adopt a physically active, healthy lifestyle. New elementary teachers were hired this year from a highly qualified pool of internal and external candidates. Under their tutelage, students engage in such activities as playing High-Five Tag, climbing and hanging on play structures, practicing catching and throwing, and learning about muscle strength and role of the heart. 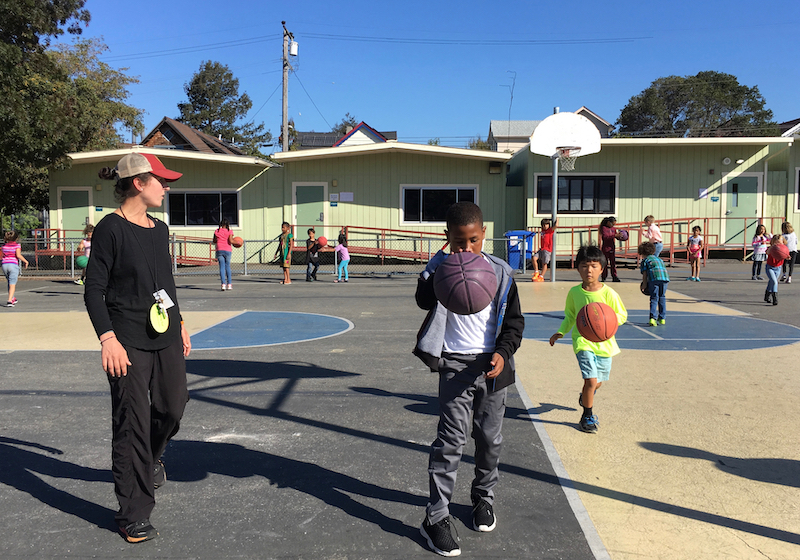 To support the implementation of the program and the new team of teachers, Director Riddle holds meetings twice monthly to work on curriculum planning and articulating a district-wide approach to teaching the California State Standards for Physical Education. Teaching of grade-level standards is designed to prepare students to reach the physical fitness goals tested in fifth, seventh, and ninth grades. Standard 5: Students demonstrate and utilize knowledge of psychological and sociological concepts, principles, and strategies that apply to the learning and performance of physical activity.